An observation: this week’s list includes two articles, one by McClatchy and one by the NYT, with breaking news on Russian interference in our election, including possible Trump team complicity. Both articles are shocking and disturbing, yet garnered little attention. It’s as if the American people are losing faith and trust in our institutions, and giving up that there will be accountability and consequences. The Sunday Times reported that Trump’s first meeting as president will be with Putin. Next day, the front page of Le Monde showed Trump standing with his back turned, and a title, “Trump Contre L’Europe” (translates, “Trump Against Europe”). The Trump transition team is considering a plan to evict the press corps from the White House. Trump later clarified, saying he won’t evict all press, but he will pick who is allowed to come. Trump’s war of words with Rep. Lewis continued for four days. Trump canceled his plan to visit Museum of African American History on MLK Day. Sean Spicer said Monday Trump never planned to be in DC, after Kellyanne Conway said the prior Friday that Trump was going. Trump ally Rep. Todd Rokita is considering legislation that would allow Trump to fire federal employees for no cause. On Sunday talk shows, Reince Priebus and Rep. Jason Chaffetz warned and attacked the director of the Office of Governmental Ethics, who has publicly challenged Trump’s conflicts of interests. In a speech, Putin defended Trump and said the Obama administration was trying to undermine Trump’s legitimacy. Michael Flynn’s son tweeted an article from a Kremlin-funded website which said Flynn should take control of the 16 US Intelligence agencies. Trump was sued for defamation by one of the woman who accused him of unwanted sexual advances. Attorney Gloria Allred said she will subpoena unseen The Apprentice footage. Secretary of State nominee Rex Tillerson’s disclosure says he intends to stay away from State decisions benefiting Exxon for only one year. Nearly 70 members of Congress and Secretary of State Kerry boycotted Trump’s inauguration. Rep. Elijah Cummings, who did attend, explained, “members of Congress have a lot of information that the public does not have,” and eventually the American people would understand the boycotts. The NYT reported law enforcement and intelligence agencies are examining communications and financial transactions between Russian officials and Paul Manafort, Carter Page, and Roger Stone. Despite his efforts to promote ticket sales through a heavily advertised online video, Trump inauguration and events were poorly attended, and no well-known celebrities agreed to perform. The streets along the inaugural parade route had thin crowds, and the entire stands were empty (see video below). Within hours of Trump being sworn in, all mention of climate change, civil rights, and LGBT were removed from the White House webpage. 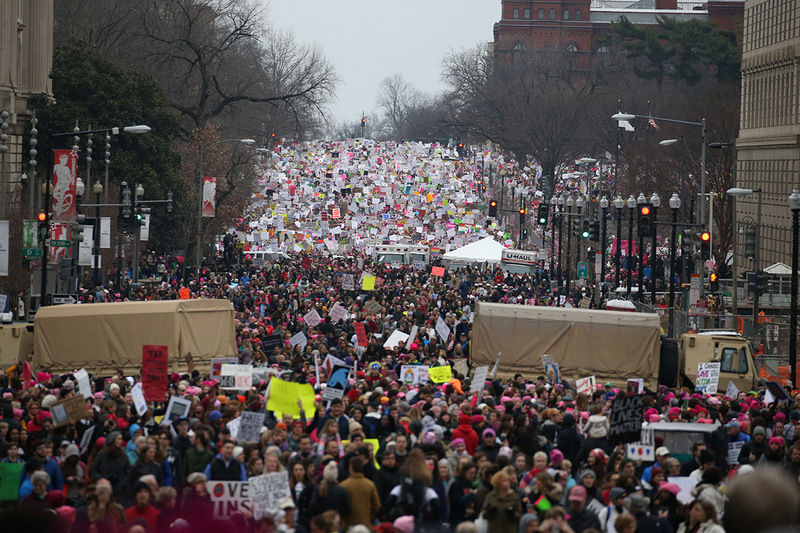 An estimated 4 million women and men marched in the Women’s March at marches around the country and the world. The protests were perhaps the largest political demonstrations in history (except possibly the Vietnam War protests).